UNL Extension is looking for an Extension Educator to provide regional leadership in the Bazile Groundwater Management Area (Knox, Pierce, and Antelope Counties), and develop focused, comprehensive educational programs that utilize available agricultural technologies to improve irrigation and nitrogen management for corn-soybean rotation cropping systems that halt the rising trend of nitrate-nitrogen concentrations in groundwater. Do you have the drive to help us with critical water and nitrogen management issues facing crop producers? Can you be a strong regional expert and develop focused, comprehensive learning opportunities on topics such as rainfed and irrigated crop production systems to reduce nitrate contamination of groundwater, use of cover crops, and crop residues to build resiliency and protect soil and water resources? This is a permanent, full-time, UNL faculty position and will be located in Norfolk at the Lower Elkhorn NRD office. This individual will work in collaboration with four Natural Resources Districts, State and Federal Agencies, and Agribusiness professionals to develop and deliver educational programs for rainfed and irrigated cropping systems programs. The goal is to halt the rising trend of nitrate-nitrogen concentrations in groundwater through implementation of improved technologies and management practices. Review of applications will be December 3rd, 2018. The Lower Elkhorn Natural Resources District will conduct public hearings and certify irrigated acres on November 8, 2018 at 7:30 p.m. These hearings will be held at the District office located at 1508 Square Turn Boulevard in Norfolk. The attached list of individuals are those who have fields in the Certification Hearing. If questions arise, please contact Mike Murphy at 402-371-7313. After an early start to harvest most farmers found themselves waiting for the rain to quit. What can a producer do to be productive? How about planning a cover crop planting? It really is never too late to plant a cover crop! The plentiful to excess autumn rainfall amounts highlight another benefit that cover crops will provide, which is using excess water. Why is that important right now you may ask? As our soil moisture profile fills during this post-harvest time frame it leaves less room in the “soil moisture bank” for storing off-season precipitation. Managing the soil moisture bank becomes even more important going into the spring when we typically receive heavier rainfall amounts and there is no crop growing to use the moisture. The risk in this scenario is that when excess rainfall percolates through the root zone and out of the reach of crop roots, it takes crop nutrients with it. You may have spread fertilizer in the fall as part of your fertility program and not end up getting the value out of it. Getting the jump on establishing another living root system in the soil before next year’s cash crop is planted is a big benefit as well. Mycorrhizal fungi depend on living roots exuding plant sugars for their survival. These fungi are important players in the soil biology, living in and around plant roots and providing water and plant nutrients from the surrounding soil in exchange for the liquid carbon in released plant sugars. A “mycorrhizal handshake” occurs when the cash crop seed germinates into a soil with the mycorrhizal fungal system already growing in it. The mycorrhizae colonize the growing seed and protect it from pathogenic fungi in the soil. The plant recognizes the mycorrhizal fungi as beneficial and begin to funnel carbon in the form of plant sugars to it to encourage their symbiotic relationship. Another benefit is weed suppression provided by the cover crop early in the season. We have all heard the saying “The best herbicide is plant canopy”. Cover crops get an early fall start and take off growing again as soon as soil temps get to a little as 35 degrees in the spring. 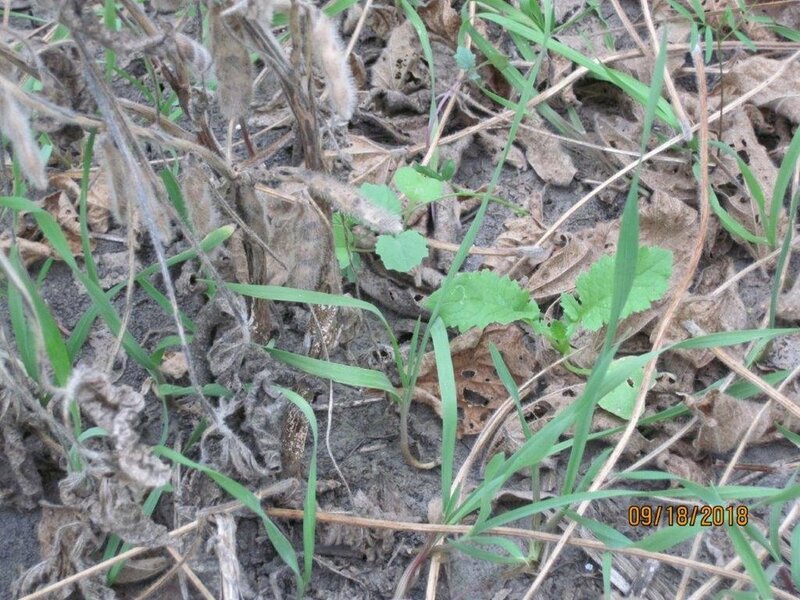 Save some money on herbicide…spend it on cover crops. Anyone who chose to aerially seed or broadcast into standing cropland this fall is likely very pleased with their results as the cool and wet conditions have really favored good growth. The cover crop will be using some of the excess moisture, helping to dry the soil out and provide a more trafficable field condition for harvesting. Earlier seeding makes the use of multi-species mixes more effective as the sunlight and growing degrees available decline rapidly in the fall. What can you plan to do now? Get your crops harvested and hit the field with a drill as soon as you can. The later start in the fall can be managed by letting the covers grow a little longer in the spring. Plant your crops into the living cover crop, a process called “planting green” and let both the cover and cash crop grow at the same time for a period of time. That period will be determined mostly by soil moisture usage by the two. This is how you manage your soil moisture bank. At the end of the day, a field planted to a cover crop planting will always enjoy an added level of protection from sheet and rill erosion and gully erosion. Look at it as an insurance policy for your land as well as your purchased and applied inputs. The Lower Elkhorn Natural Resources District and USDA-NRCS offer some attractive financial incentives for trying cover crops on your farm. Stop in or call them for more information on one of the latest and greatest beneficial soil conservation practices. Marty Marx from Wayne aerially applied a multi-species cover crop with a helicopter seeding service August 31. Benefitting from Mother Nature’s plentiful rainfall, the cover crops surface-germinated and are set to provide a wide range of benefits from soil erosion prevention and regenerating his cropland soils to managing his soil moisture bank. The jump start the cover crops get also allow them to sequester unused crop nutrients, provide a mycorrhizal environment for the germinating seeds and early season weed suppression. The Northeast Area FFA Land Judging Contest was held Tuesday, October 2nd near Oakland. 462 students from 24 high schools registered that morning at the Burt County Fairgrounds in Oakland before traveling to the testing site at Summit Lake. A team from Pender High School finished first with the top score of 789 points. Team members are: Kelcie Bartlett, Sarah Krueger, Liberty Baker, and Jessica Krueger. Another team from Pender High School placed second with a score of 760. Third place went to Norfolk High School with a score of 756 points. Wisner-Pilger and West Point-Beemer came in 4th and 5th. The top 6 teams that will participate in the state competition are from Pender, Norfolk, Wisner-Pilger, West Point-Beemer, North Bend, and Blair. The State Land Judging competition will take place in the Wahoo area on Wednesday, October 17th. The top individual award went to Charles Schmedding of Pender with a total score of 298. Kaleb Hasenkamp of West Point was second, Kelcie Bartlett of Pender was third, Ryan Gaughen of North Bend was fourth, and Sarah Krueger of Pender came in fifth. The site provided good diversity in soils and landscape positions for the students. 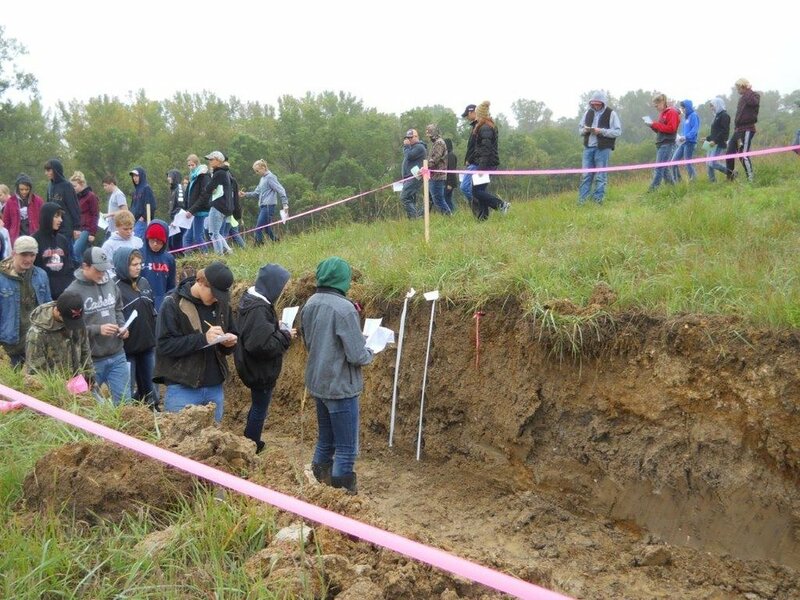 The contest helps the students make informed decisions regarding soil utilization in the future. Scoring was completed the following day at the Lower Elkhorn Natural Resources District (LENRD) office in Norfolk. The high schools participating were: Arlington, Allen, Blair, Emerson-Hubbard, Howells-Dodge, Humphrey, Laurel-Concord-Coleridge, Clarkson-Leigh, Logan View, Lyons-Decatur Northeast, Madison, Norfolk, North Bend, Oakland-Craig, Pender, Pierce, Randolph, Schuyler, Scribner-Snyder, Stanton, Tekamah-Herman, Wayne, West Point-Beemer, and Wisner-Pilger. The LENRD, the Natural Resources Conservation Service, Oakland High School, and the Nebraska FFA Land Judging Committee organized and sponsored the contest. NORFOLK -- The Lower Elkhorn Natural Resources District (LENRD) has been monitoring the groundwater throughout the district for over 40 years. In the early ‘90s, a Groundwater Management Plan was established to protect the resource for future generations. The LENRD is charged with the responsibility and authority to implement controls as necessary to both protect and remediate groundwater quality. Concern for groundwater quality and the growing health concerns for the public, as well as the desire to further implement best management practices to prevent groundwater contamination, are the primary reasons the district has expanded the geographic area of the Phase 2 & 3 Groundwater Management Area in Pierce and northern Madison Counties. Concerns about high nitrates in the district have risen as long-term monitoring has shown increasing levels of nitrate concentration in much of the groundwater in Pierce County, and most recently in small portions of northern Madison County. Results indicate that of the approximately 40% of the registered wells sampled in Pierce County, the average nitrate-nitrogen level is 11.7 parts per million (ppm). The U.S. Environmental Protection Agency (EPA) has set a maximum contaminant level of 10 ppm for nitrate-nitrogen in drinking water supplies. Several health concerns are related to the consumption of high nitrate water. Nitrates can be particularly harmful to infants under six months of age. Excessively high nitrates can lead to methemoglobinemia, a condition that is commonly known as “blue baby syndrome” in which there is a reduction in the oxygen-carrying capacity of blood, potentially leading to death. Pregnant women and other adults with certain health conditions may also be at increased risk. Preliminary results from another study also indicate a potential positive link between groundwater nitrates and the incidence of birth defects and non-Hodgkins lymphoma. · Defines nitrogen fertilizer as a chemical compound in which the percentage of nitrogen is greater than the percentage of any other nutrient in the compound and, when applied, results in an average application rate of more than twenty-five (25) pounds of nitrogen per acre over the field to which it is being applied. Defines nitrogen fertilizer as a chemical compound in which the percentage of nitrogen is greater than the percentage of any other nutrient in the compound and, when applied, results in an average application rate of more than twenty-five (25) pounds of nitrogen per acre over the field to which it is being applied. The effective date of the adopted changes is October 15, 2018. The Lower Elkhorn Natural Resources District (LENRD) has issued a Request for Proposals (RFP) to provide inspection and preventative maintenance services for all propeller-driven, analog display irrigation well flow meters (Propeller Meters) installed in the District. This project includes the provision of all labor, equipment and expertise to perform preventative maintenance services for an estimated 776 flow meters located within the District by April 15, 2019. These inspection and preventative maintenance services include, but are not limited to: a physical examination and evaluation of proper flow meter installation and operation; removal of the flow meter to evaluate the condition of the propeller and bearings; reinstallation of the meter after greasing its bearings and replacing the saddle gasket; documentation of all inspection; maintenance findings and activities through photos and reports in a format provided by LENRD; and application of an LENRD maintenance sticker to the Propeller Meter. The LENRD will supply grease, gaskets and other preventative maintenance supplies for this project. These inspection and maintenance activities will be performed during the non-growing season, which is from October through April. Payment for these services will be negotiated between the District and the contractor but not more frequently than monthly for each completed inspection. The District is seeking to have the Propeller Meters within Antelope and Madison counties serviced (see the map attached). Proposals are for the two counties collectively; bids for each county separately will not be accepted. The full RFP is attached. If you have any questions please contact Austyn or Curt at the LENRD office (telephone number (402) 371-7313 or by email at ahouser@lenrd.org or cbecker@lenrd.org). Proposals must be submitted by 4:30 p.m. on Friday, October 12, 2018 to the NRD office. Being proactive in the conjunctive management of groundwater and surface water is what led the Lower Elkhorn Natural Resources District (LENRD) Board of Directors to implement a voluntary Integrated Management Plan (IMP) for the protection of the resources. The citizens of the LENRD depend on abundant water resources for domestic, agricultural, and industrial uses, all of which contribute to the economy of the district. Water resources are also important for wildlife habitat and recreational uses such as fishing, hunting, boating, and swimming. In early 2012, the LENRD board took action to initiate development of a joint voluntary IMP with the Nebraska Department of Natural Resources (NDNR), to provide a needed framework for wise, long-term management of finite water resources. In 2013, the NDNR and the seven NRDs that make up the Lower Platte River Basin, formed the Lower Platte River Basin Coalition. The Coalition’s mission is to coordinate efforts to protect the long-term balance of the Basin’s water uses and water supplies. A primary action of the Coalition was to voluntarily develop a Lower Platte Basin Water Management Plan, which was adopted by all parties as of January 10, 2018. The LENRD continued to move forward with their individual plan, and developed a Stakeholder Advisory Committee consisting of representatives from: Agriculture, Industry, Public Water Supply, Domestic well owners, Environmental, as well as County and City officials. This Committee met in 2014 and 2015 to help prioritize goals and action items of the IMP. The district continued to work with the NDNR to develop a working draft over the next several years. The NDNR and the LENRD jointly held a public meeting to discuss and answer public questions on the IMP on August 9, 2018. A public hearing was then held on August 23, 2018, where public testimony on the final version of the plan was recorded. After reviewing the testimony, the LENRD board voted to approve the IMP at their September 27th board meeting. In other action, the board authorized LENRD General Manager, Mike Sousek, to sign the contract with JEO Consulting Group to update the District’s Hazard Mitigation Plan. The board also authorized the signing of an interlocal agreement for obtaining seedling trees and shrubs with the Nebraska Association of Resources Districts for the LENRD’s Conservation Tree Program. In other business, staff was authorized to solicit bids for flow meter maintenance on mechanical meters in Madison and Antelope Counties for 776 meters and will sign a contract with the lowest responsible bidder. The next committee meeting will be held on Thursday, October 11th at 7:00 p.m.. The next board meeting is scheduled for Thursday, October 25th at 7:30 p.m. at the LENRD office in Norfolk. The Norfolk Tree Advisory Board, Nebraska Forest Service, and Lower Elkhorn Natural Resources District (LENRD) will host two workshops in Norfolk on Tuesday, September 25, 2018. The afternoon workshop will be held at the Norfolk Public Library on Riverside Boulevard from 1:00 p.m. to 4:30 p.m. and will focus on the arboretums across northeast Nebraska and how they were established. Arrive around 1:00 p.m. and register for door prizes. Justin Evertson with the Nebraska Statewide Arboretum will start the afternoon off and talk about how communities can establish their own arboretum and what services the Nebraska Statewide Arboretum provide. He will also talk about some tree plantings that are happening right here in northeast Nebraska and how your community can get in on the future plantings. We will follow that up with Arboretum Curators from arboretums across northeast Nebraska giving quick overviews of their sites and talk about the trees they have planted and the challenges and successes they have had. Pam Bergstrom with the LENRD will talk about how to promote and advertise tree projects and plantings within your own community. She will also talk about ways the LENRD has promoted their own arboretum at Maskenthine Lake and other promotions that local communities have done. In the evening, the public is invited to join us at the Skyview Lake Arboretum and meet at the north shelter just off the 18th Street and Maple Street entrance. From 5:30 p.m. to 6:00 p.m. you will get a chance to talk one on one with tree experts about tree problems you may be having, what tree to plant in your yard, or to identify diseases, insects, or tree species from samples you bring with you. At 6:00 p.m. lace up your walking shoes as we will take a walking tour of Skyview Lake Arboretum and stop to talk about certain trees and point out trees that are doing well and should be considered for your next tree planting project. Don’t forget to bring comfortable walking shoes, a notebook with pen or pencil, and water. 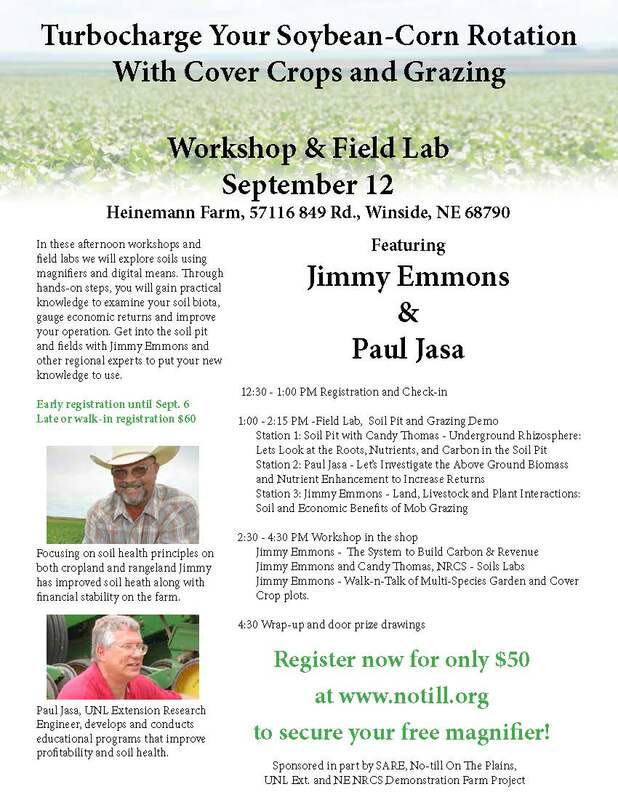 These two workshops are being provided by the City of Norfolk, Nebraska Forest Service and the Lower Elkhorn Natural Resources District and are free to the public. If you plan on attending the afternoon workshop, you will need to register. To register for the afternoon workshop, please contact Sheila Schukei at 402.844.2034. Tree Workshop - Skyview Lake - 5:30 p.m. to 7:00 p.m. It was a beautiful day to get outside and learn about trees! That’s what 130 fourth graders found out at the 10th Annual Walk in the Woods held on Wednesday, September 5th at the West Point City Park. The event is usually held at Wilderness Park in West Point, but the recent rainfall made conditions there too wet. 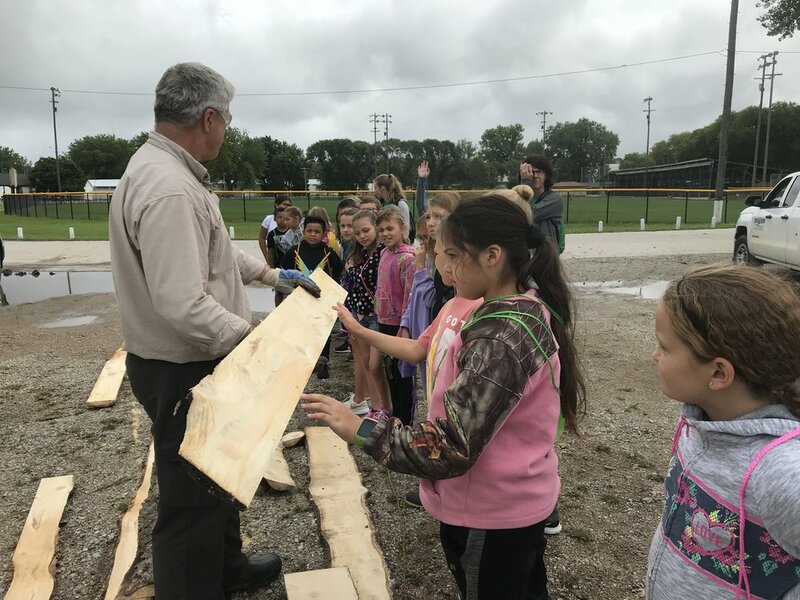 The hands-on learning day was moved into town and focused on the importance of trees, wildlife, and prairie. Students from West Point-Beemer Elementary, Guardian Angels Catholic School in West Point, St. Paul Lutheran School in West Point, and Wisner-Pilger Elementary attended the event. The Walk in the Woods event is sponsored by the Nebraska Forest Service, the Great Plains Society of American Foresters, and the Lower Elkhorn Natural Resources District. Other presenters and volunteers included staff from the Natural Resources Conservation Service, and the Nebraska Game & Parks Commission. Farmers within the Lower Elkhorn Natural Resources District (LENRD) boundaries, will have an opportunity to apply for new irrigated acres for 2019. The LENRD board voted, at their August meeting, to allow up to 2,500 acres of new groundwater irrigation development in the Hydrologically Connected or 10/50 Area, and to allow up to 2,500 acres of new groundwater irrigation development in the Non-Hydrologically Connected or Non 10/50 Area under the district’s standard variance process for 2019. The board established a sign-up period to receive applications for Standard Variances. The district will receive applications for standard variances between September 4th, 2018 and October 3rd, 2018. Contact the LENRD for more information. The Lower Elkhorn Natural Resources District (LENRD) and the Nebraska Department of Natural Resources (NeDNR) hereby provide notice that the LENRD and the NeDNR shall hold a public hearing on August 23, 2018, at 7:30 p.m. at the LENRD office, located at 1508 Square Turn Blvd. in Norfolk, Nebraska. The purpose of the hearing is to take testimony on the proposed LENRD/NeDNR Integrated Management Plan (IMP) and the proposed controls. The geographic area for the proposed IMP encompasses the entire land area within the LENRD boundary. The geographic area of proposed groundwater controls is where groundwater and surface water are hydrologically connected within the LENRD boundary. The geographic area of proposed surface water controls is the extent of the Lower Elkhorn River Basin that is within the District boundary. Chapter 7 of the voluntary IMP outlines the two controls for groundwater management and two controls for surface water management that are consistent to meet the goals and objectives of the IMP. These controls are 1) Limits on the development of new groundwater and surface water irrigated acres, and 2) Required measuring devices on certain wells and surface water diversions. The groundwater controls apply to a geographic sub-area of District; a map of which can be accessed in Chapter 5. The surface water controls apply to the Elkhorn River Basin portion of the District, a map of which can also be accessed in Chapter 5. Any interested person may appear at the hearing and present written or oral testimony concerning the proposed IMP and proposed controls. Individuals with disabilities may request auxiliary aids and service necessary for participation by contacting the LENRD or the NeDNR by August 15, 2018. Testimony or other evidence relevant to the purposes of the hearing may also be submitted in writing to Lower Elkhorn NRD, 1508 Square Turn Boulevard, Norfolk, Nebraska, 68701, or the Department of Natural Resources, P.O. Box 64676, Lincoln NE 68509-4676, or by electronic mail at dnr.legalfile@nebraska.gov by 5:00pm, August 21, 2018. Following the public hearing the LENRD and the NeDNR will make a joint decision within 60 days of whether to implement the proposed IMP with or without modifications and whether to adopt and implement the controls as proposed in the IMP. A public meeting will be held on Thursday, August 9th to inform the public about the background, development process, implementation, and what having a Voluntary Integrated Management Plan (IMP) means for water quantity management in the LENRD. The IMP has been jointly developed for the LENRD and the Nebraska Department of Natural Resources. The public meeting will begin at 6:00 p.m. in the LENRD board room at their new location, 1508 Square Turn Boulevard in Norfolk. The Lower Elkhorn Natural Resources District (LENRD) serves all or parts of 15-counties in northeast Nebraska with a mission of improving the quality of life for all citizens by conserving, developing, and managing all natural resources. The LENRD Board of Directors met on Thursday, July 26th for their regular meeting. The board continued their discussion on the City of Norfolk’s Johnson Park River Rehabilitation Project along the North Fork of the Elkhorn River. LENRD Director, Scott McHenry, of Norfolk, said, “The City’s plan to develop the Riverfront Project will provide more recreational opportunities close to home. I can’t take a lot of time off during the summer months, so it’s important to me and my family to find things to do locally.” He added, “I have received a considerable amount of feedback from the people in my Subdistrict in support of this project.” After much discussion, the board voted 8 to 5 to support the Riverfront Project with the City of Norfolk with a financial commitment of $1.032 million divided out over four years, which will be 1/3 of the project cost. In other action, the board appointed Aaron Zimmerman of rural Pierce as the new director to the vacant Subdistrict 1 Board of Directors seat. Nine individuals applied for the position, with one withdrawing before Thursday night’s meeting. The board interviewed the remaining candidates, with Zimmerman receiving the majority vote in the end. The other applicants were: Rick Christiansen of Plainview, Donovan Ellis of Pierce, Tom Nathan of Meadow Grove, Wayne Rasmussen of Plainview, Jay Reikofski of Foster, Aaron Sauser of Tilden, and Roger Tacey of Osmond. Prior to the board meeting, the LENRD held an Open House Public Hearing from 5:00 to 7:00 p.m. regarding the Groundwater Management Area and the possible changes to the proposed Phase 2 & Phase 3 Areas in Pierce County and northern Madison County, due to the elevation of nitrates in the drinking water. LENRD Assistant General Manager, Brian Bruckner, said, “We were pleased with the turnout for the public hearing. We wanted to inform the public of the possible changes to the management area and work together to formulate plans for the future protection of our groundwater.” The board will review the testimonies given at the public hearing and will vote on the proposed changes at the next board meeting on Thursday, August 23rd at 7:30 p.m. The Lower Elkhorn Natural Resources District (LENRD) will hold an Open House Public Hearing on Thursday, July 26th from 5-7 p.m. at their new office at 1508 Square Turn Boulevard in Norfolk. The purpose of the hearing is to receive public comment on proposed amendments to the district's Groundwater Management Area Rules & Regulations. The LENRD has been monitoring the groundwater across their 15 counties for over 40 years. In the early ‘90s, a Groundwater Management Plan was established to protect the resource for future generations. As the monitoring continued, elevated levels of nitrates were detected in portions of Pierce County. The initial Groundwater Management Plan contained language that informed both the Board of Directors and the general public, of the triggers and potential controls that could be imposed within a Groundwater Management Area, using a phased approach to managing the resource. Years have passed, and the nitrate levels in some areas are not declining, and additional portions of the District are experiencing elevated groundwater nitrates, including northern Madison County, even with Best Management Practices in place. High nitrates in our drinking water can have negative health impacts, and some communities within the area have been required to invest significant financial resources to upgrade their infrastructure in order to deliver a safe, reliable source of drinking water. Therefore, the LENRD is proposing changes to the Groundwater Management Area in an effort to keep the nitrate levels from increasing. Due to a vacancy on the Lower Elkhorn Natural Resources District (LENRD) Board of Directors, the Board is now taking applications to fill the remainder of a four year term (2017-2020) for Subdistrict 1. Applicants must be registered voters and reside within the boundary of the subdistrict shown below. A more detailed map is available at the LENRD office. A resume’ should be submitted to the LENRD by July 19, 2018. A sample resume’ form is available at the LENRD office. Candidates will be invited to address the Board of Directors at the July 26, 2018 board meeting to be held at the LENRD office in Norfolk. A letter of invitation will be sent to all candidates. The Lower Elkhorn Natural Resources District (LENRD) serves all or parts of 15-counties in northeast Nebraska with a mission of improving the quality of life for all citizens by conserving, developing, and managing all natural resources. The LENRD Board of Directors met on Thursday, June 28th for their regular meeting. Each year, the LENRD measures the water levels of 240 irrigation wells across the district. From 2017 to 2018, 42 of the wells measured an increase 2 to 5 feet. LENRD Water Resources Technician, Dallas Dorey, gave his yearly report at the meeting. He explained, “Overall, the spring water levels throughout the district increased this year, with the exception of the southeast portion. Some wells in the southeastern part of the district saw moderate declines.” More information can be obtained by contacting the LENRD office. In other business, the board continued their discussion on the City of Norfolk’s Johnson Park River Rehabilitation Project along the North Fork of the Elkhorn River. LENRD Director, Jill Barr, of Norfolk, said, “The City’s plan to create recreational opportunities along the river could attract more people and businesses to the Norfolk area. One of the LENRD’s 12 responsibilities is the development and management of recreational and park facilities, and I think it’s important that we keep that in mind when reviewing projects like this.” The board will continue their discussion of the project at their next committee meeting and budget workshop on July 12th. LENRD Projects Manager, Curt Becker, announced that the district has worked with the producers across the district and have found that all flow meters have been installed on irrigation wells. The board instructed the general manager to issue cease and desist orders, if needed, to any landowner that is found to be irrigating without a flow meter as they continue with their inspections across the district. In other action, the board approved the cost of living salary adjustment of 1.8% for staff and approved the step and grade changes proposed by management for Fiscal Year 2019. The board also authorized the staff to advertise for the Subdistrict 1 Board of Directors seat that is currently vacant. Applications are due by July 19th. More information and a map of the subdistrict is available on the district’s website. The next board of directors meeting will be held on Thursday, July 26th at the LENRD office at 1508 Square Turn Boulevard in Norfolk. Prior to the board meeting the district will conduct an Open House Public Hearing from 5:00 to 7:00 p.m. regarding the Groundwater Management Area and the possible changes to the proposed Phase 2 & Phase 3 Areas in Pierce County and northern Madison County, due to the elevation of nitrates in the drinking water. Visit the district’s website for the latest news and updates. The Lower Elkhorn Natural Resources District’s (LENRD) dual concern for groundwater quality and the health of the public; along with the responsibility to enact controls and further implement best management practices to mitigate and prevent groundwater contamination, are the primary reasons the district is considering a modification of the geographic area of the Groundwater Quality Management Area in Pierce and Madison counties. An Open House Public Hearing will be held on Thursday, July 26th to provide information and to receive feedback on the proposed changes to the Groundwater Management Area along with the controls that could be implemented to protect the groundwater in that area. Concerns about high nitrates in the district have risen as recent monitoring has shown increasing levels of nitrate concentration in much of the groundwater in Pierce County, when compared with long-term monitoring data from the same area. Comprehensive sampling of Pierce and Madison County irrigation wells was conducted in both 2015 and 2017, with over 700 samples collected. The average nitrate concentration of the samples collected was 13 ppm. Some communities in Pierce County have also been plagued with high nitrates in their drinking water and have had to invest in new infrastructure or other remedial measures to supply safe, reliable drinking water to their residents. Several health concerns are related to the consumption of high nitrate water. Nitrates can be particularly harmful to infants under six months of age. Excessively high nitrates can lead to methemoglobinemia, a condition that is commonly known as “blue baby syndrome” in which there is a reduction in the oxygen-carrying capacity of blood, leading to death. Pregnant women and other adults with certain health conditions may also be at increased risk. Because of these potential health risks, the U.S. Environmental Protection Agency (EPA) has set a maximum contaminant level of 10 parts per million (ppm) for nitrate-nitrogen in public water supplies. The LENRD’s Groundwater Management Area has a system of four phase levels. The designated boundaries for the phases may follow either natural or political boundaries. The boundaries may be drawn around existing problem areas or potentially vulnerable areas. "The use of several phases allows the district to adapt different requirements to assorted conditions," said Brian Bruckner, LENRD Assistant General Manager. He added, “The requirements for an area may change, and are tailored to fit the conditions that exist within a designated phase area."